It's to be expected that a major Southern city like Raleigh, N.C., would have a strong traditional basis for its food. The fact is, you have to do a bit of research and ask a lot of questions to find what you might think of as old-fashioned, down-home fare in the South. It's to be expected that a major Southern city like Raleigh, N.C., would have a strong traditional basis for its food. The fact is, you have to do a bit of research and ask a lot of questions to find what you might think of as old-fashioned, down-home fare in the South. Barbecue smoke is not pouring out of every downtown storefront, there are more KFCs and Popeyes than there are indigenous fried chicken places, and really great biscuits are hard to find. As I noted a few weeks ago about Raleigh, the city is very much on the move and has grown a crop of first-rate contemporary and ethnic restaurants, although it is woefully lacking in good Italian places to dine. 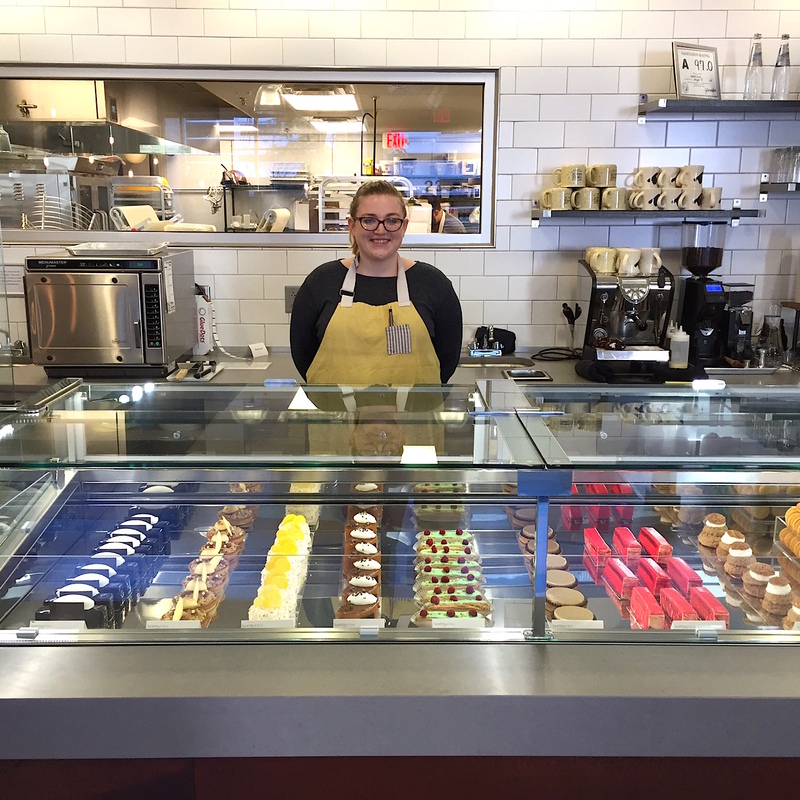 And now there are some terrific bakeries and cafés, along with the kind of down-home places you might have thought would be everywhere in town. On a recent trip to Raleigh, I found all I was looking for. 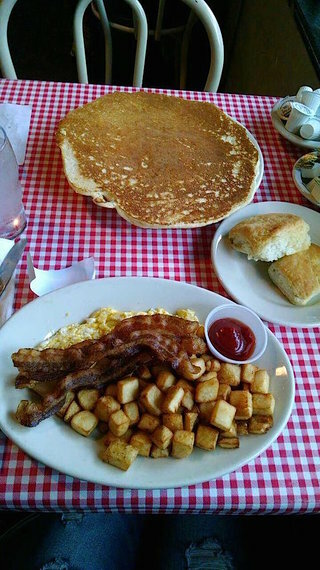 For something very traditional indeed, your first stop in town should be for breakfast or lunch at Big Ed's City Market Restaurant (above), founded in 1958 by Ed Watkins, whose family once produced tobacco and other crops in Wake County. As part of the revitalization of the City Market in 1989, Watkins was coaxed downtown, where his wide open dining room has all the trappings of what you'd hope to find in a Southern city like Raleigh. The room is festooned with artifacts and gewgaws, flags, and road signs. The tables are covered with gingham oilcloth and Big Ed himself (right) is usually decked out in a gingham shirt and blue overalls. Yet nothing about the place seems, to use a Yankee word, kitschy. 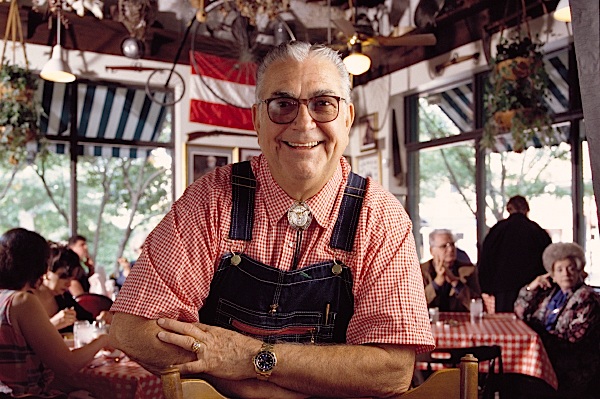 The friendliness of the greeting and the helpfulness of the waitresses (who will tell you that you ordered way too much) add vitality to a very mixed crowd of people, high and low, for whom eating here is the thousandth or first time. The menu is enormous but the prices are, like those for a gallon of gas, what you thought you'd never see again: two eggs with country ham and red-eye gravy $8.89, fried catfish with one egg $9.99, fatback with a biscuit $1.99, and a biscuit with sausage gravy $3.89. Now, the trouble with some places like Big Ed's is that they use inferior and cheap ingredients to keep prices low, but I'd stack up Big Ed's local eggs, grits, Nahunta pork sausage, Carolina Packers smoked sausage, corned beef, pickled beets and "real" creamed potatoes against all competitors'. 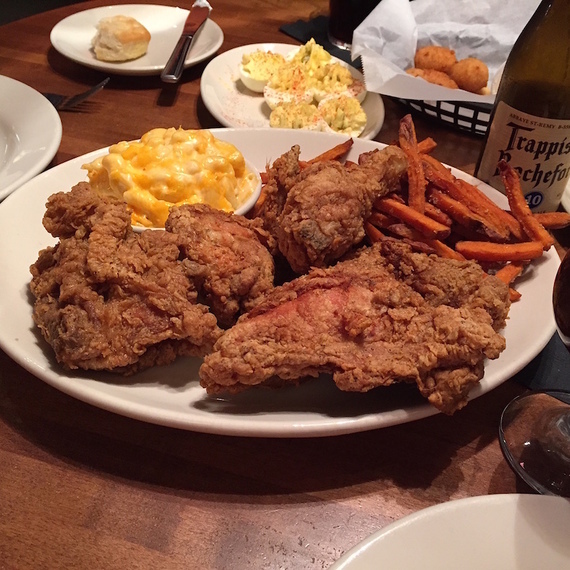 You can get tender fried chicken livers over rice and gravy ($8.49), excellent, crisp Southern fried chicken ($8.59), chicken in house pastry ($8.49) and just-baked strawberry short cake and banana pudding, all in daunting portions. And then there's Ed's justly famous hotcakes (left)--one of which ($7.89) is plenty for breakfast, lapping over the edges of the plate, so that if one person can eat three ($9.89), he gets a free t-shirt--are perfect flapjacks, tender enough to soak up the butter and syrup, evenly golden brown, with a wonderful downhome aroma. I've only really hinted at the complete menu at Big Ed's. There's a great deal more, all done with the same degree of quality, just like that of the hospitality of the people who work here. You get a big smile coming and going. The Pit, in Raleigh's warehouse district (with a branch in Durham), is a lot more than a barbecue joint, for it has an extensive menu of other items and is warehouse-large in size. But the premises are built around whole hog pit cooking, with all the pigs used raised in North Carolina using free-range farming practices. Owner Greg Hatem grew up raising pigs in Halifax County, and he also knows a great deal about how to cook them, in addition to Texas-style brisket, barbecued turkey, and a first-rate fried chicken (below). Additionally, he goes outside the 'cue box by stocking an amazing array of wines, beers and 21 bourbons. The long menu offers everything from skillet cornbread with house-made butter ($3.99) to fried green tomatoes with goat's cheese and smoked tomato vinaigrette ($6.59) and Brunswick stew ($4.99). And one good way to appreciate The Pit is to order the Sampler ($13.99), a big platter of smoked wings, BBQ soul rolls, deviled eggs and potato fritters. Frankly, I prefer a little more smoke to my barbecued ribs (above) than those I had at The Pit, but you can try different styles, including Eastern NC pulled pork ($13.99), beef brisket with Western NC BBQ sauce ($17.99), and others. Desserts ($6) are all very sweet, but share at least one--Aunt Hattie's double "chocolate chocolate" cake, or the moist, old-fashioned carrot cake with candied pecans and molasses cream cheese frosting, or the chef's hand pie with a scoop of vanilla ice cream. 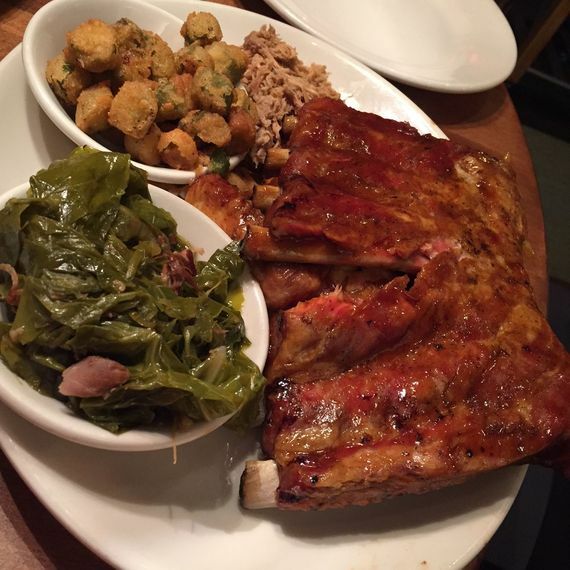 You'll probably leave The Pit with a doggie bag and your next meal will be in it. La Farm Bakery has a unique charm, for in Southern cities you don't usually find such serious bread and pastry making based on French classic models. 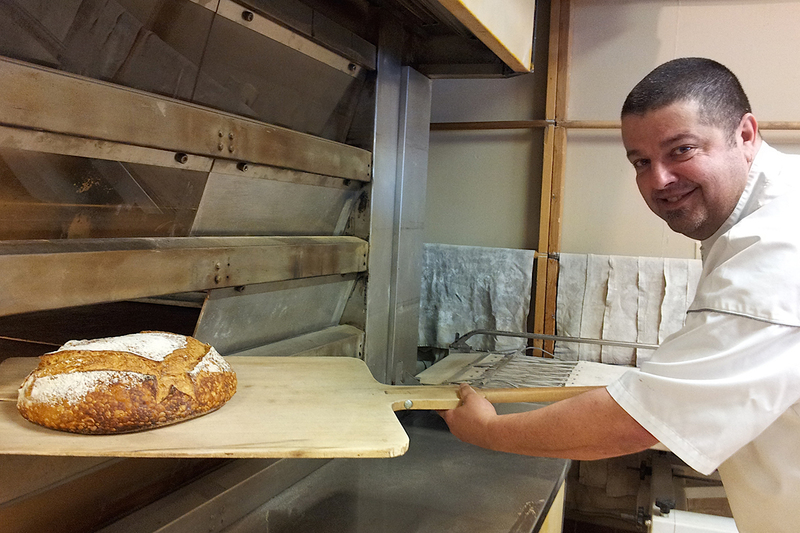 But after years traveling the globe in search of bakery secrets, including the artisans' guild Les Compagnons du Devoir, Lionel Vatinet (above) and his wife, Missy, were smart enough to see a niche in the Research Triangle and filled it handily back in 1999. The place has rarely seen an empty chair since. Wedged into a nondescript strip shopping center, La Farm offers 15 different styles of daily breads and an additional 20 seasonal breads throughout the year, all slowly leavened over three days and baked in a European-style hearth oven. It's the smell of that bread baking that hits you when you open the door. 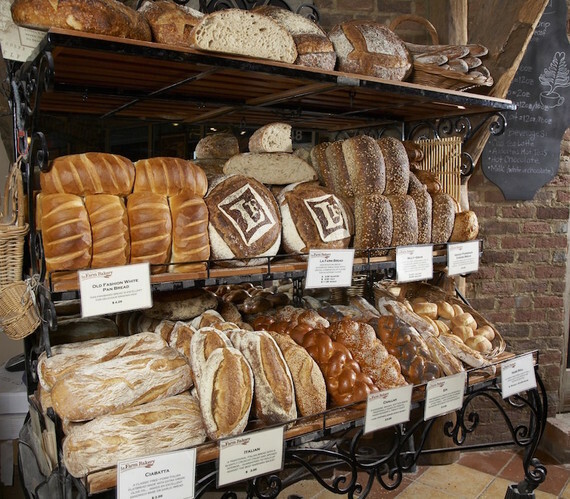 The Vatinets proudly use only local flours, honey, jam and ham, and the taste of the South is truly in everything they produce. More amazing is the Vatinets' expansion into lunch and dinner dishes like shrimp rémoulade ($7.95) and sandwiches, but the heart and soul of La Farm is in the breakfasts, where I had the most delicious croque monsieur and croque madame sandwiches ($8.95), bubbling with cheese and oozing Mornay sauce, as good as any I've found this side of Paris. The tartine Diablo ($8.95) is a beauty--fluffy scrambled eggs with tasso ham, spinach, cheddar, tomatoes and jalapeños on crisp Asiago Parmesan bread. This is a place easy to love, and the people of Raleigh and the area have shown an unquestioned pride in La Farm for the work of people who had a dream and made it work better than anyone might have hoped, right in their hometown. South Salisbury Street, which runs past the state capitol grounds, is slowly coming alive, and in the most endearing way Lucette Grace (above) is making things simmer. Chef-owner Daniel Benjamin, born and raised in Indiana, trained for years with some of America's best pastry chefs, and the finesse he picked up shows in the quality, beauty and color of the myriad cakes and tarts and cookies and cupcakes and macaroons displayed in the well-lighted glass cases and counters in his small, cheery shop. You might come in at 8 a.m. for a Dixie Cannonball cheddar and scallion biscuit, or even baked oat porridge with stewed fruits and salted nuts. Or you might take a coffee break with a pain au chocolat or a buttermilk scone. At lunch there's lentil soup with garlic bread and a beef and chorizo chili with cornbread. Or you might splurge at any time on the gorgeous dessert pastries like perfectly flakey millefeuille with peanut butter mousse, caramel cream, and caramel peanuts, or an orange "Creamsicle" tart on brown butter cake with vanilla mousse and almond shortbread. These are not the kinds of delectables easily found anywhere, unless the devotion of the patissîers is unflinching and their appreciation of the local tastes guides their hand. It all works well at Lucette Grace; it would be a very special place anywhere, but as a catalyst to downtown Raleigh it's a real prize.